Mixtapes are a way to show your affection for someone. Fill them up with Silly Love Songs, give them to the one you like, and see how they react. They can also be shared between couples. In more gloomy occasions, someone can fill a mixtape full of sad songs and listen to it while silently pining after another. While less common, mixtapes can also be given for similar reasons between friends and family. Mixtapes are traditionally audio or video cassettes, however, due to Technology Marches On this has been expanded to CDs and digital playlists. You're still more likely to see them in cassette format, though. Having a physical sign of the romance can be more appealing. Cassettes also have more of a nostalgia factor than a CD, and are considered by some to be more aesthetically pleasing (not to mention that it's easier to re-record a mixtape on a cassette compared to a CD-R, in which you need to burn a new blank disc entirelynote rewriteable "CD-RW" CDs do exist, but are prone to accidental erasure and have a much lower range of compatibility than conventional CD-Rs). Kaworu makes a mixtape for Rei as a Christmas present in Advice and Trust. He wanted to make something for her, but his adamite nature means that he has Creative Sterility. Shinji's suggestion of a mixtape proved to be a good workaround. Vinyl's dad: You wouldn't be here if it weren't for cassettes. Vinyl Scratch: I know, I know, most romantic mixtape ever. [sigh] Fine. See you later, Dad. In Guardians of the Galaxy, Star-Lord's Walkman and the "Awesome Mix Vol. 1" mixtape that resides in it were gifts from his late mother. He treats them as Number One Dimes. Not Another Teen Movie has Ricky (a parody of Pretty in Pink's Ducky) trying to declare his love to Janie with a mixtape. Janie, oblivious, puts it in a stack with the many other mixtapes he's given her. In High Fidelity, romantic mixtapes are practically Rob's Signature Move when it comes to wooing a girl. At the end of the film version he makes one for his girlfriend Laura as he finally feels he has learned how to make her happy. In The Perks of Being a Wallflower. Sam gives Charlie a mixtape as a gesture of affection/friendship, and Sam getting getting Charlie into music symbolizes how she welcomes Charlie into her friend circle. Sam and Charlie are in a case of Will They or Won't They? throughout the book, with Charlie having a crush on Sam that may or may not be reciprocated, and the mix tape is one of many gestures by Sam that signals possible interest on her part. On Friends, Chandler needs a last minute Valentines Day gift for Monica and finds an old mix tape. Unfortunately, it was a gift from his ex Janice, which is made clear when her screeching voice pops up in the middle of "My Funny Valentine". Out of Jimmy's Head: In the pilot movie Re-Animated, Jimmy decides to impress Robin by burning a mix CD, something that his cartoon friends, who are out of touch with modern culture, have never heard of. Jimmy: I'll just take a bunch of MP3s and burn them into a CD. How I Met Your Mother: Marshall and Lily have been together since their freshman orientation at college and the mix tapes they made for each other pop up from time to time. In one episode, they eat dinner at a restaurant that used to be Lily's apartment. One of the mix tapes is playing in the background, complete with Marshall's "I love you" message. Marshall: I love this song. I haven't heard this in forever. Lily: I'm pretty sure this is a mix tape you made me in sophomore year. Marshall: [on tape] I love you, Lily. Happy Valentine's Day 1998. In Deadly Class, Marcus makes a mix-tape for Maria as a present after they've been secretly dating for a while. Tift Merritt's "Mixtape" is about making mixtapes for a lover. The Semisonic song "Singing In My Sleep" is about receiving a mixtape. "Mixtape" from Avenue Q involves Kate getting a mixtape from Princeton. At first it seems romantic, but as Kate looks over the list she notices that they're a mix of Friendship Songs, Silly Love Songs, and just random songs. Kate ends up confused until she looks at Side B and sees that they're romantic songs... But then it turns out Princeton is making mixtapes for all his friends. The song ends with him asking Kate on a date. 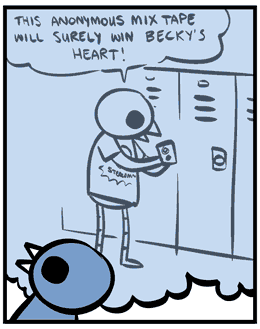 This trope is jokingly made out to be a poor decision of adolescence in the January 13th, 2011 strip of the online comic Nedroid, entitled "Memories of Youth". Reginald is about to commit Seppuku when Beartato exclaims, "Hey! Stop! What are you doing?" As an example of I Hate Past Me, Reginald explains, "Oh, I just remembered all the embarrassing things I did as a teenager." Beartato tells him to move on from the past, but a thought balloon pops up in Reginald's mind wherein he sees himself as a teenager at his school locker. This younger Reginald proudly proclaims, "This anonymous mixtape will surely win Becky's heart!" Present Reginald then attempts to drink poison. Band vs. Band: Turpentine is a punk rocker and Honey Hart is a bubblegum pop singer. They are also girlfriends. In "Tape vs. Mix" they make mixtape cassettes for each other, and even though the songs aren't really to their liking, they appreciate it for capturing the other's personality and feelings. Manic Pixie Dream Wife: Chance has a problem: He married a Manic Pixie Dream Girl. His wife Simone is a rabid indie fringe music freak who bombards him with mix CDs. As he heads to work, she hands him several of his morning mixes (for as he drives to the freeway, for as he gets above 50 miles per hour, for sole reflections and quiet moments after he parks but before he surrenders himself to the drudges—) He hopefully interrupts her and says he accidentally lost all of her blank CDs, but she replies that blank CDs are like tampons: A girl always has some stored in most unlikely places. And sure enough, she has stashes and stashes of blank CDs in their house. One character in Summer Camp Island has a box full of mixtapes they've made for their crush on the king. They end up playing one and singing when they finally confess their love. Episode nine of Over the Garden Wall has a flashback of Wirt making a poetry-filled audio cassette mixtape for his crush, Sara. Hijinx Occurs and Everything Goes Wrong when he tries to get the tape back from her. We learn that trying to retrieve the mixtape is the Inciting Incident that lead to Greg and Wirt going "over the garden wall" in the first place. In episode 10 (the final episode), Sara and Wirt reunite and Sara tells Wirt that she hasn't listened to the tape yet, as she doesn't own a cassette player. Wirt offers for her to listen to it at his house, which she accepts.